Barnet residents who need legal advice on anything from housing, welfare, benefits, children and family to domestic violence, immigration, wills and probate, and debt and bankruptcy can visit the Legal Advice Centre (LAC) at Middlesex University. Booked appointments are available every Wednesday 2pm-4pm during term time. The centre was set up last year, in association with STS Solicitors, in response to recent government cuts to the Legal Aid Agency, which restricted access to many who need legal advice. The pro bono service was so successful that the team have decided to open it again this academic year. 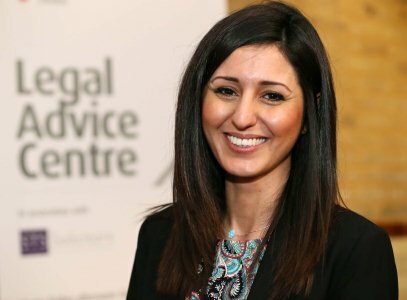 "Our service is an attempt to sustain access to justice for disadvantaged people in the community whilst also giving law students the opportunity to obtain experience in the legal field"
Husniye Sera Ustek-Bazen, Principal of STS Solicitors and a Middlesex BA Business Law graduate, is leading the initiative. She will be joined by a number students at the centre, which is based on campus, whom she will guide as they gain valuable work experience. She said: "There are so many people in need and that do not have access to justice. The continued cuts made by the Legal Aid Agency are having a detrimental impact on the most vulnerable. "Our service is an attempt to sustain access to justice for disadvantaged people in the community whilst also giving law students the opportunity to obtain experience in the legal field." Over the next year, up to 14 students will have the opportunity to work in the LAC as part of the School of Law's Clinical Legal Education programme led by Dr Susan Scott-Hunt. Third year LLB student Aaliyah Freemantle said she was proud to be serving those in need in the local area. She said: "We're thrilled to be able to make a positive impact on the community by helping those in most need. "In a competitive recruitment market, the Legal Advice Centre allows us to gain valuable experience, which will be useful when seeking employment after graduation." Senior Lecturer Lughaidh Kerin, who will be overseeing the students, added: "It's a delight to be able to bring back the Legal Advice Centre, with the help of Husniye and STS Solicitors. "We had such a fantastic response from the community last year. The students are given exposure to the world of work whilst also gaining so much life experience." The Legal Advice Centre is available by appointment only at College House, Middlesex University, The Burroughs, Hendon, London NW4 4BT. To book contact MDXLac@mdx.ac.uk or call 020 8411 3416.